Originally published in paperback in 1976, this instant bestseller and seminal classic is back from the depths and in print for the first time in hardback. 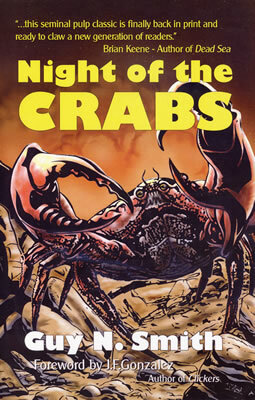 “Night of the Crabs” spawned an entire series about giant crustaceans with a taste for human flesh and crowned Guy N. Smith king of pulp. Professor Cliff Davenport, one of the UK's leading botanists, is expecting a visit from his nephew, Ian Wright, and Ian's fiancée, Julie Coles, who are vacationing on the Welsh coast. However, the couple never arrives. Instead, Davenport gets a visit from the police informing him they found his nephew's car abandoned with the couple's clothes inside. It looks as if they were swept out to sea while swimming. Davenport heads to the Welsh coast to help search for the couple, but what he finds is something far different. On the beach are strange tracks in the sand, tracks that look like claw marks, crab claws, from impossibly huge crabs. It's not long before the professor is hunkered down in the sand dunes watching in horror as giant crabs the size of cows crawl from the sea with almost human-like expressions of evil on their faces. The professor rings up an old friend in the Ministry of Defense and the troops are sent in. They hit the crabs with bullets, mortars and tank fire, but the crabs get back up and keep coming, tossing transport trucks and the tank into the sea like toys. The carnage is stopped only when the leader of of the crabs, the most monstrous beast of them all, King Crab, clicks his claws and sends them back into the sea. Now it's up to Professor Davenport to find the monsters' underwater lair and devise a way of exterminating them before they push farther inland, crushing villages and killing hundreds of people along the way. “Night of the Crabs” is a quick, fun read that never tries to be anything other that what it is: pulp fiction at its best. Smith keeps the plot arrow straight, the cast of characters minimal and the action non-stop. There are gallons of blood, buckets of bowels and loads of dismembered limbs. Oh, yes, and giant, cattle-sized crabs. This new version of the book includes an intro by the author, foreword by J.F. Gonzalez, prologue and epilogue, a new chapter and additions to several others. The hardback version is limited to 100 signed copies with a paperback run ongoing. Durant Haire has been writing for 13 years, working as a reporter, copy editor and copywriter. 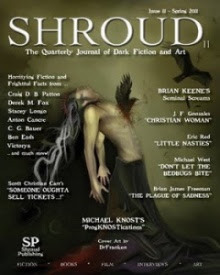 His stories have been published in magazines and books such as Dark Wisdom, Dark Lurkers, Darkness Rising and Decadence 2 to name a few. He lives in North Carolina and holds a B.A. in English.